Falling temperatures and fewer daylight hours indicate winter is almost here. But they are definitely not an excuse to quit your outdoor running routine. In fact, running in cold weather will help you feel better, boost your energy level, and lose the unwanted weight before the bathing suit season. When you’re running or moving at full intensity, you feel 20 degrees warmer than your starting temperature. So, when you’re dressing to hit the road, you should choose clothes that keep you warm without overheating and chilling. Consider wearing several thin layers of clothing, starting with a layer of synthetic material such as polypropylene, which wicks sweat from your body. Avoid wearing cotton because it holds the sweat and will keep you wet. The right outer layer should help protect you against wind and precipitation, while still letting out heat and moisture. A breathable layer of nylon or Gore-Tex will do the job! About 40% of your body heat is lost through your head and 30% escapes through your hands and feet. When you’re running in low temperatures, make sure you always wear a snug-fitting hat, gloves mittens and wool socks that wick moisture away. 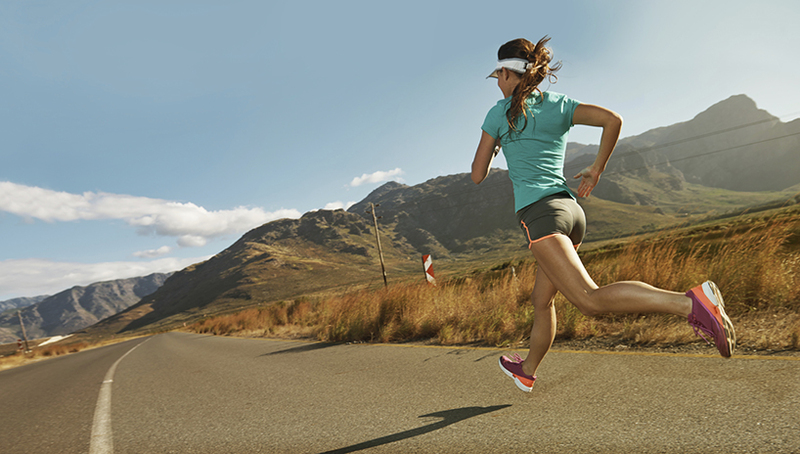 To avoid catching a chill when you’re sweaty, start your run into the wind and finish with it at your back. You can even break this into segments, running into the wind for about 10 minutes, turning around to run with the wind at your back for five minutes, and repeating. 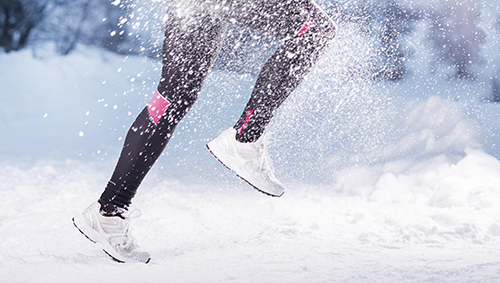 With limited daylight, it’s more likely that you’ll be running in the dark during the winter. If you can, avoid running in such conditions. But if you have to run at night or early in the morning, wear reflective and fluorescent gear and dress in bright colors, specially if the landscape is covered in snow. When running in the cold, you’re at greater risk for a pulled muscle. On such conditions, warm up slowly and run easy. If you prefer to run in the morning or in the evening, when the temperatures are much colder, try doing it twice a day instead of doing one long run where you might get very cold toward the end. As soon as you stop a physical activity, your core body temperature drops. The same happens if you get wet from rain, snow, or sweat. To avoid chilling or even hypothermia, change to some dry clothes – including socks, gloves and hat – as soon as you can and get warmer at a shelter with a hot drink. Do you run outside in cold temperatures? Share your own safety tips for cold weather running in the comments below! Running is considered as one of the most complete workouts. It’s not only good for your body, but it also helps you to improve your mood and clear your mind. If you’ve been thinking about lacing up and you’re looking for some extra motivation to get off the couch, read on for 5 wonderful reasons to start running today. There’s no exercise more natural than running. And starting couldn’t be simpler! All you need is a good pair of sneakers and comfortable workout clothes to get out there and run. Yet, if you’ve never hit the road before, you’ll want to do it slowly. By starting at a fast and uncomfortable pace, you risk injuring your body and losing your motivation. Therefore, to get all the health benefits that running has to offer, be sure to choose the right training plan. 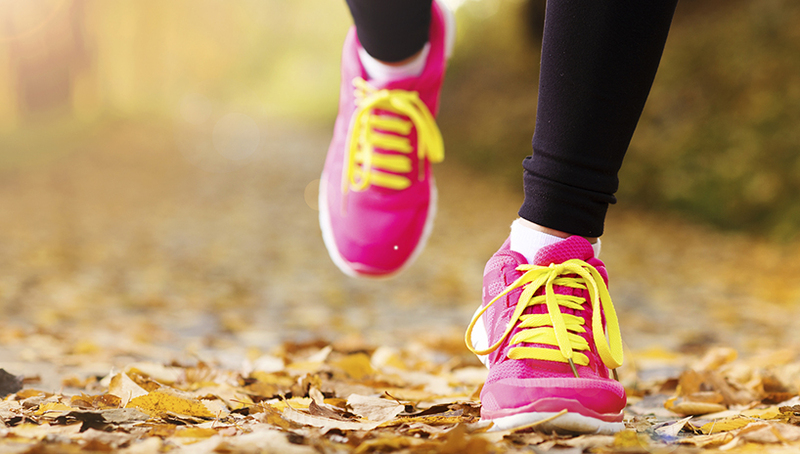 If you’ve never run before, start today with our Ease into 5K app. As you already know, an active lifestyle helps you live a more healthy and disease-free life. In fact, many studies have shown that regular exercise helps to prevent cancer, heart disease, stroke, and diabetes. Also, regular joggers tend to have a lower blood pressure, good cholesterol levels, and a strong immune system. And the health benefits of running don’t end there. Your regular runs reduce the risk of vision loss, age-related macular degeneration and cataracts. Ever wondered why you feel much better after working out? When you’re running, your brain releases endorphins and neurotransmitters that can instantly lift your mood. It also lowers the hormones that can contribute to depression. In fact, mental health experts use running to help treat clinical depression and other psychological disorders such as drug and alcohol addiction. But that’s not all. Researchers found that just 30 minutes of running could boost sleep quality and concentration during the day. 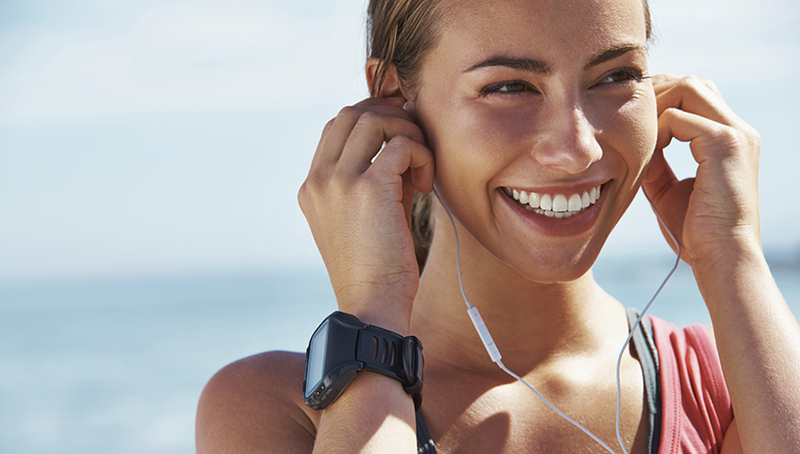 You know – and feel – that you’re burning calories while you’re running. But did you know that, from all those gym staples, the treadmill is the one that helps you blast the more calories? According to the Medical College of Wisconsin and the VA Medical Center, the treadmill (used at a “hard” exertion level) torched an average of 705-865 calories in an hour. Also, regular exercise boosts “afterburn”, which is the number of calories you burn after exercise. This happens when you’re running a little faster than your easy pace, and a little slower than your fastest pace. According to experts, all you need to do to add years to you life is work out 2.5 hours a week (30 minutes, 5 times per week). Studies show that people who meet just this amount of physical activity are 19 percent less likely to die prematurely than those who don’t exercise. You don’t even have to run at fast speeds! So, even if you’re currently out of shape, you should be able to run, live longer and healthier! Bluefin Software is powered by a husband and wife duo, Alex and Tanya Stankovic. Together, we develop apps for mobile devices. Our apps are more than just beautiful at their core, they're designed around the fitness experiences of real people and supported by the latest knowledge in health and fitness, software design, and technology.